“Both,” came the reply, what a great start to the season new boat and a new location. 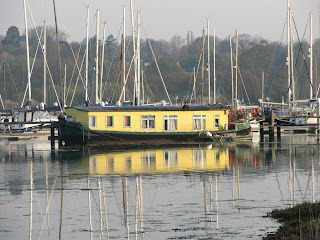 The boat looks like a Wauquiez Centurion which were built around 1973, I believe to a Holman and Pye design. 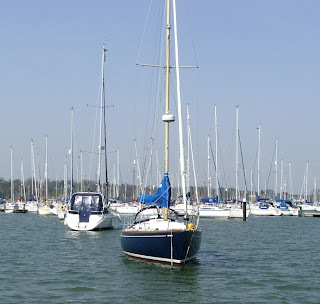 I really like this type of boat, with fine lines they typically sail well and have a nice motion, even when the going gets rough. 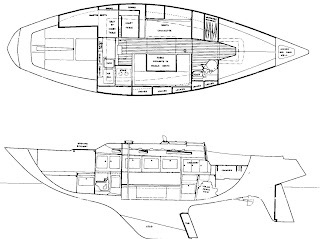 The downside for such characteristics is space, especially interior volume. 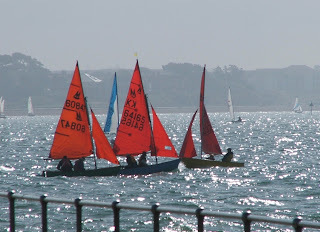 Back to the Sailing Future with Tillerman’s writing challenge. I was thinking about Tillerman’s latest writing challenge “Sailing in the second space age” while I was dozing on the train. For some reason I just couldn’t shake off the image of Rodney Mathews “The Ice Spirt”, a sci-fi come middle-earth poster, which hung on thousand student walls during the 70’s; that decade which brought us the musical horror that was the band Sailor (“I’ve got the music, I’ve got the lights, you’ve got the figure full of delights…”) and of course the Morris Marina (nice nautical link there!!). In my dream, Sigourney Weaver joined Luke Skywalker in a post, punk, apocalyptic, wetland, world defending the bulk carrier Nostromo against belligerent and slimy, alien pirates attacking the ship from their Lasers and Toppers. We escaped to Tennyson down on the Isle of Wight, for a close encounter with an over large Fairline Flybridge, lit up like a Christmas tree, which was playing four note jingles, while the crew waved good bye to ET, who was sailing out past the needles on his way home. I will stress that at no time during the 70’s or since have I ever experimented with mind altering drugs. 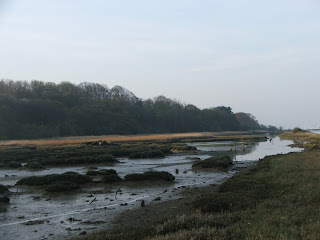 Saturday I went for an early morning run, the sun was just coming up over the trees on the eastern shore, the river was about as good as it gets. Sometimes you just don't need words. With the Frostbite Series just a dim and distant memory, plus the recent warm weather, local racers were out in force on Sunday morning. 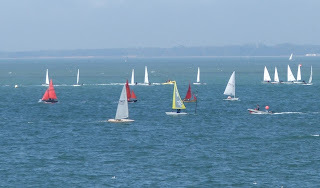 The cliffs above Hill Head are a perfect vantage point to watch a Solent Sunday. 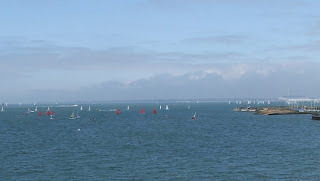 Right across the Solent to Cowes Roads the large boats were gathering pre race(pic above and below). 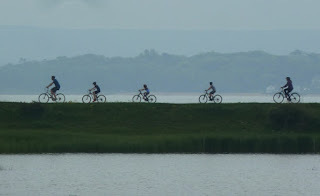 While off Hill Head the sailing club was taking advantage of the morning high water. 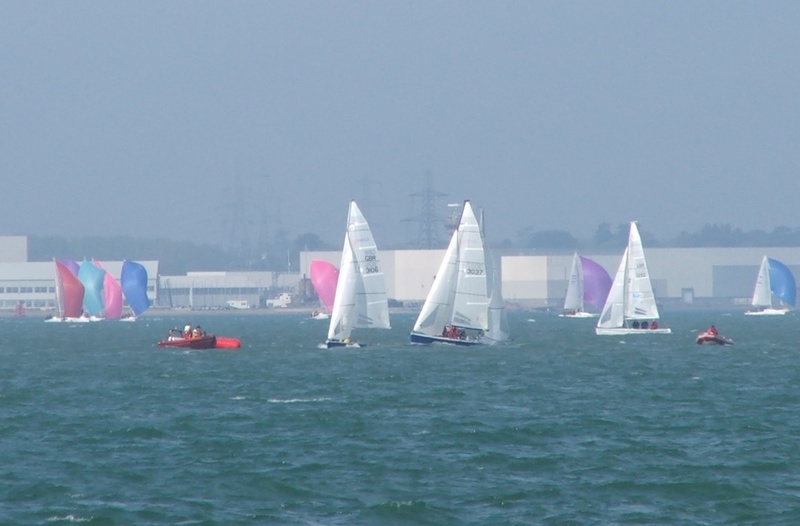 Out in Southampton water there was another fleet, the boats in the foreground look like SB3's while in the background another group are on the spinnaker run. Mirrors off the entrance to Hill Head harbour entrance. 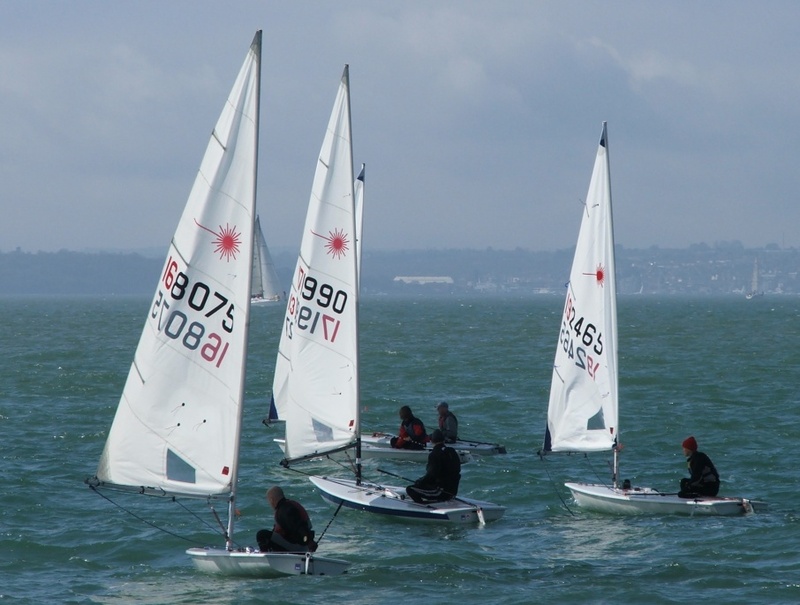 Heading out for a mixed start. I thought it was a bit odd when local pilot cutter Westerman turned up on the hard at a local marina. 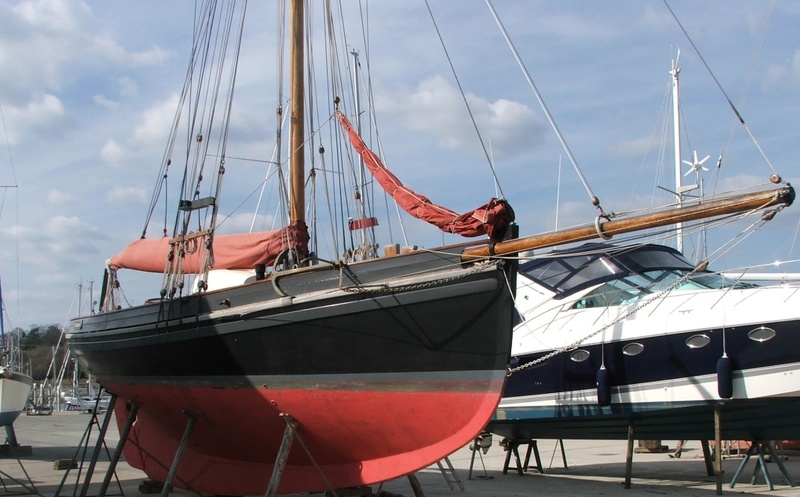 She was built for yachting journalist Tom Cunliffe and has been up for sale over winter. 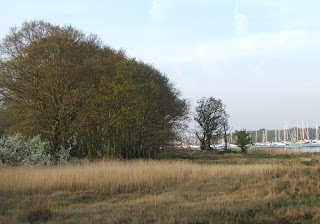 I bumped into Tom's daughter at the Hamble River Rowing day and she confirmed that Westerman had been sold the previous weekend. 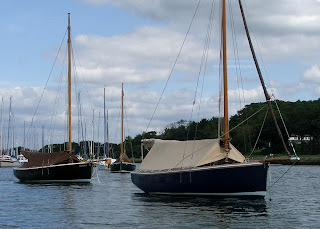 Designed by Nigel Irens as a modern day interpretation of the Bristol pilot cutter, Westerman was the first in a series built by Covey Island Boatworks, Nova Scotia in 1997. 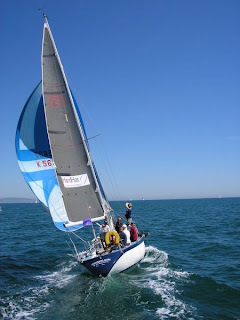 Since then Tom has sailed her far and wide, as well as being a regular race winner with the Solent Old Gaffers of which Tom is area president. 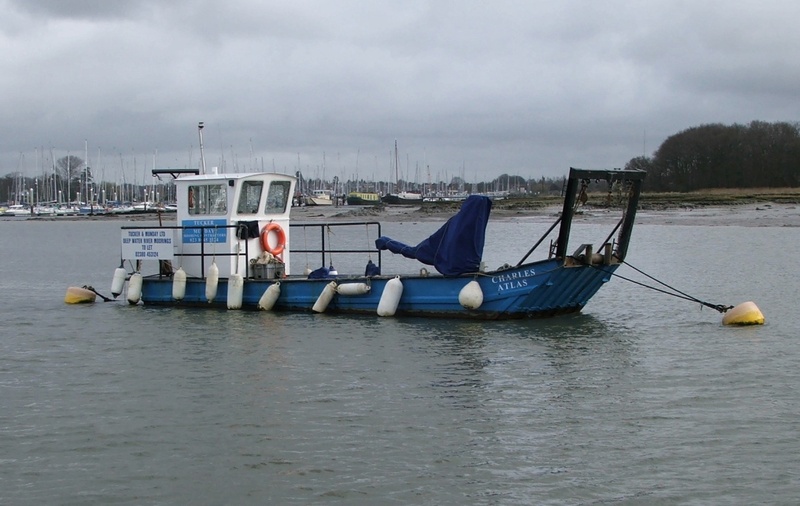 This work boat always amuses me, it's used by Tucker and Munday, the local mooring contractors for laying and maintaining moorings in the river. It's fitted with some heavy lifting equipment and is appropriately named "Charles Atlas"
Saturday's kickoff event for the Hamble River Rowing was blessed with some of the best weather of the year and a really good turnout of local people keen to find out about recreational rowing on the river and join in. 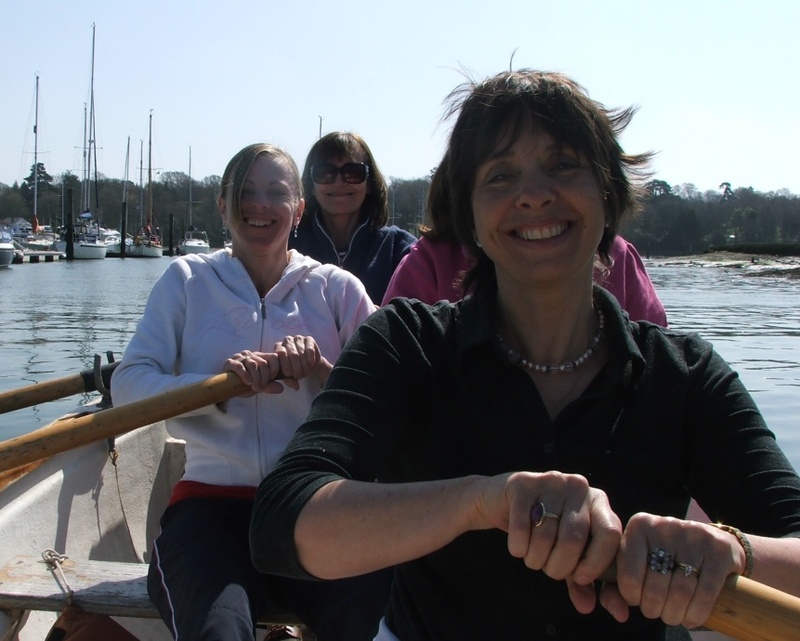 Around 80 people turned up at The Jolly Sailor with a mix of experienced rowers to complete novices. 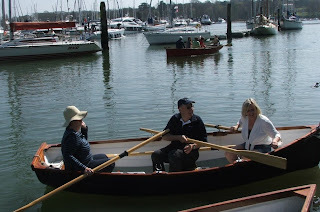 Several Bursledon Gigs were on hand and were kept busy rowing out around Lands End Point and back. 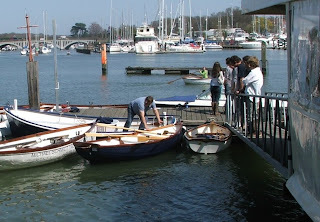 The Bursledon Gig has four rowers plus a cox, there were also smaller boats like the 12 foot Egret (above). 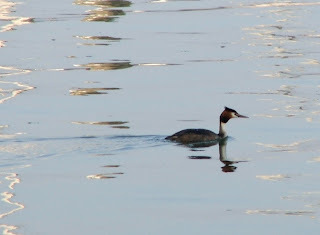 With the sun out and the river at it's best it was a great day and everyone seemed to have a good time. 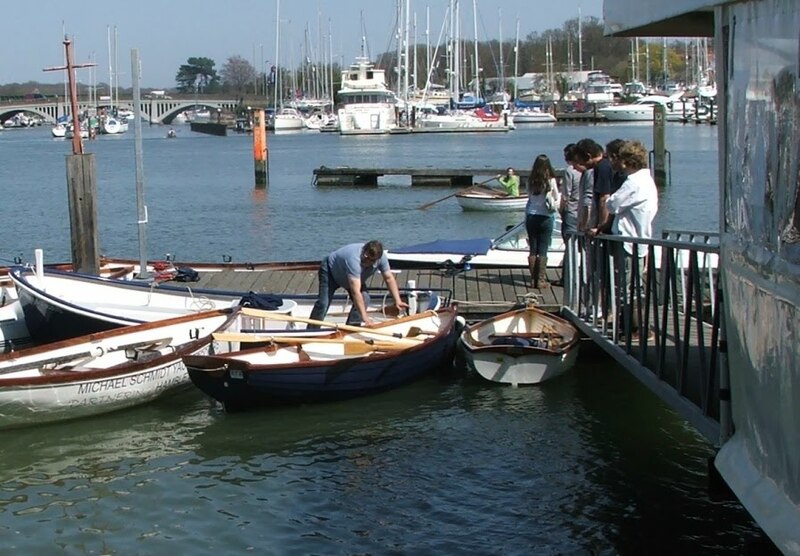 The next HRR event is evening rowing on Tuesday 4th May, starting at 6.00 pm. 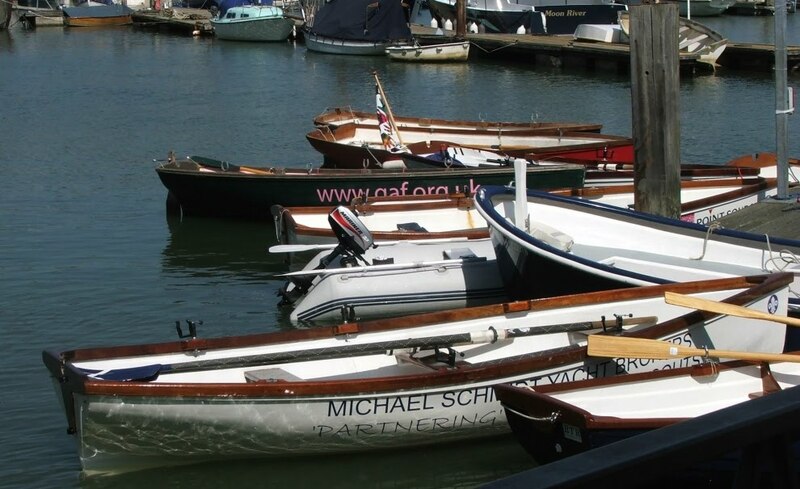 The full rowing diary is available on the HRR website along with membership details. 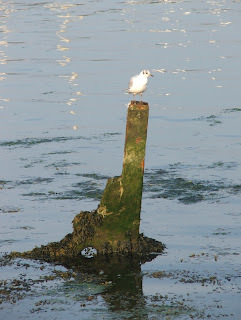 Normally this blog is an antidote to work, but I thought this was worth comment. There are now more than 1 billion transistors for each and every person on the planet. The big idea from IBM is that with all that computing power and the ability to connect it up (via the Internet, wireless, mobile phones etc) we have the opportunity to capture and use information to create a “Smarter Planet”. To some that might sound like an Orwellian nightmare, so it’s good to see where the application of technology is used to improve the environment. It’s worth a comment on John Cohn who is an IBM Fellow and Distinguished Engineer, IBM has only appointed around 194 Fellows since 1963, out of a 400,000 IBM global workforce, it's the highest technical merit the company can bestow. They are pretty special people, scarily clever scientists or technologists with a bunch of patients to their names, who help IBM push forward the boundaries of the possible. 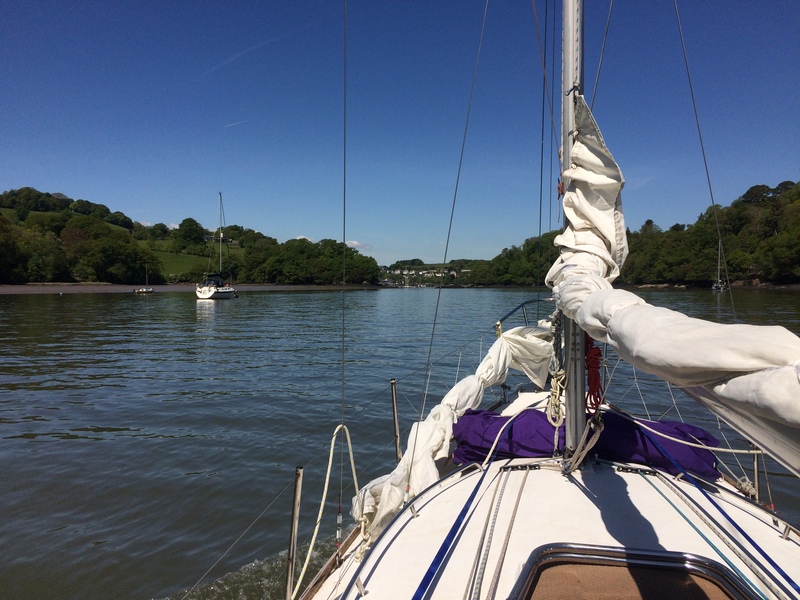 I sent John a note asking if he’d like to do something similar on the Hamble River – don’t hold your breath! 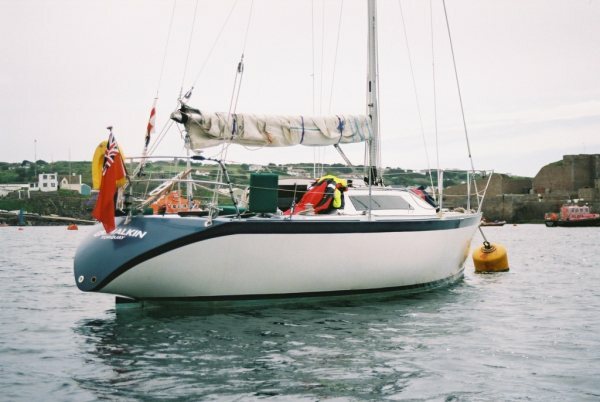 I posted about Fastnet yacht Grimalkin back in October last year, so it was nice to get an email from her owner Keith Grainger. Keith has owned her since 2003, fitting her out for both racing and cruising. 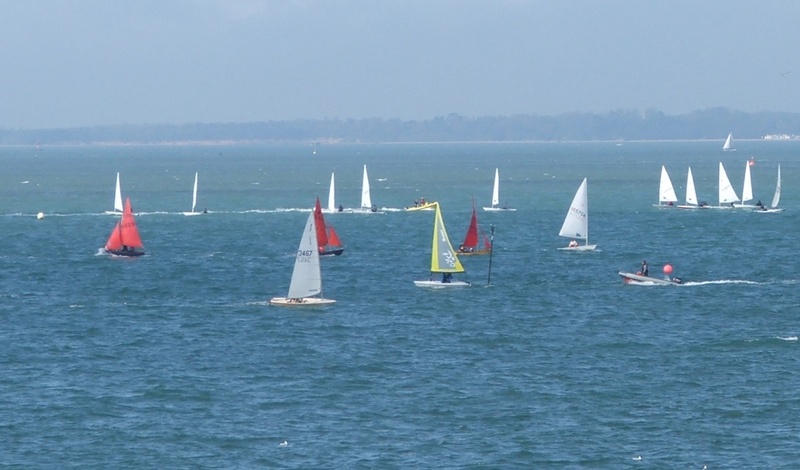 After 40 years of sailing the channel ports, Keith reports that "the prospect of another wet and cold beat across the channel or Lyme Bay, has lost some of its allure", a point we fully understand. As a result Grimalkin is sadly up for sale. 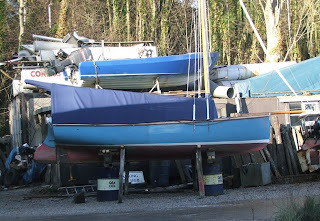 Thanks to Keith for these pictures of what is a boat with a unique history and I understand in good condition for her 32 years. 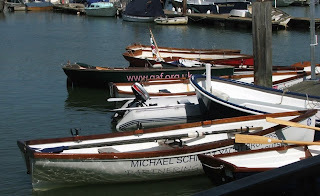 While most of the GRP boats were rushing to get into the water, some of the local wooden boats were just coming out. 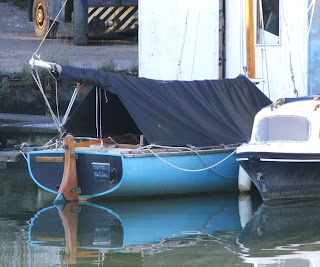 Provided you keep the rain water out a wooden boat is often better off afloat over winter. Come spring, a quick haul out over a couple of weeks for paint, varnish and anti foul is sometimes all that’s required for the new season. 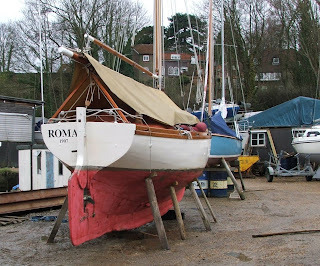 Just as Greta was launched, our friend’s boat Roma was being brought ashore for painting, anti foul and general tidy up in order to be ready for the 2010 YOGAFF festival in Yarmouth on the Isle of Wight. 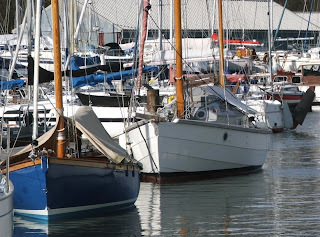 Not that she needs too much as owners Mike and Jessica keep her in nice condition as befits her 100 odd years. Built by Trouts of Topsham in Devon, 103 years ago, I understand she was originally a quarter decked open boat built for salmon fishing, presumably around the Exe estuary. 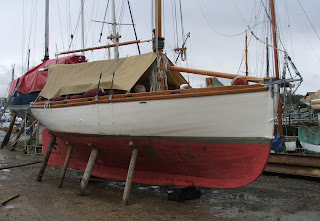 Converted to a yacht in 1919, I believe she’s built of pitch pine on oak frames, with the original elm keel supporting a cast iron ballast keel. 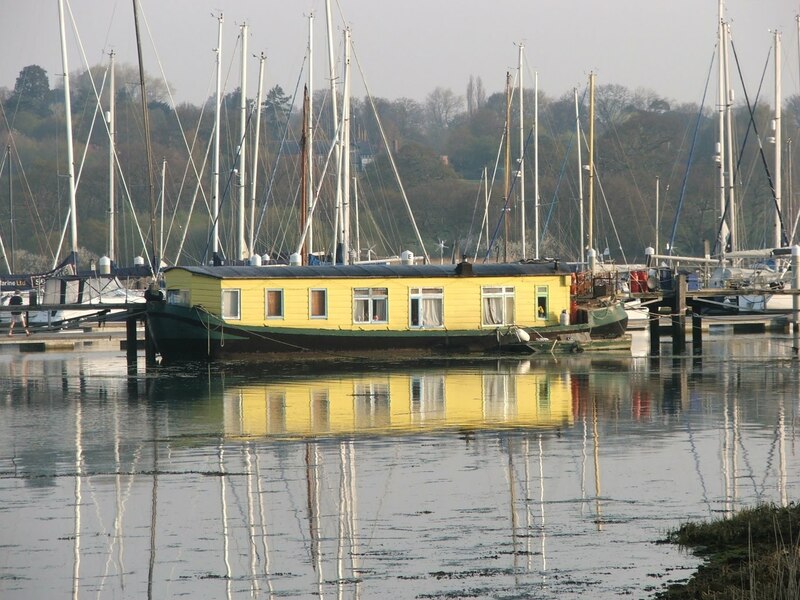 Although built in Devon you could probably describe her as an Itchen Ferry, certainly a classic Edwardian cutter. I can't quite believe it's a year to the day when Joe was born! Some while ago, the government floated the idea of mandatory child development records, which parents would be obliged to keep until their children reached school age. Since Joe is well into the “m,m,m,mum-mum” and “d,d,d, dad-dad” phase of speech development and as conscientious parents, Erica and I thought it would be good to fully test his cognitive ability. So that's vocabulary, numeracy and contextual appreciation - Job Done!! 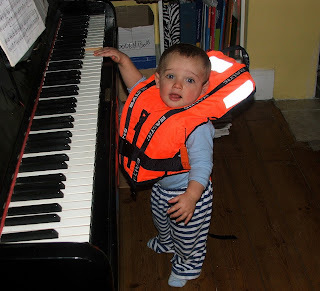 After all that effort, time for a quick tune on the piano and then down to the boat for a sail!! 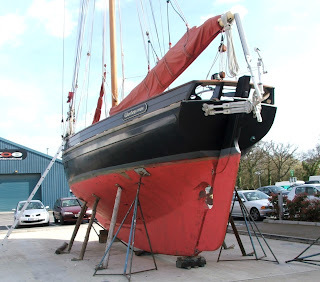 It’s that time of year, the yard wanted to make the most of a big spring tide to launch as many boats as possible before the Easter weekend, the challenge was to get Greta rigged and ready. 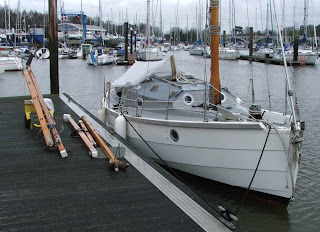 So it was out with the yellow trolley and two trips down to the yard, one to take the main mast and the second with the mizzen, booms, gaff and bowsprit. I worked out that from garage to boat was about half a mile each trip, it was hard work, who needs to go to the gym. The unsettled weather didn’t help too much, I had just got the bowsprit on and set up the roller furling, when it poured down, so we were forced to retreat to the Jolly Sailor for a couple of hours and lunch. Fortunately the only outstanding task was to fit the batteries and start the engine, which after the rain, plus a few coughs, started nicely despite being idle all winter. 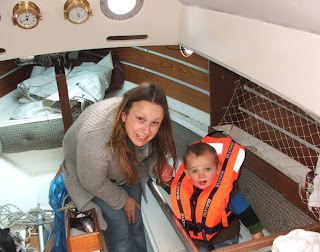 Joe came along to help out; as you can see the cabin needs a serious sort out after being used as a winter store, but at least Greta is now afloat and almost ready for a sail as soon as the good weather arrives. Greta looking trim and ready for the season, but check out the lovely blue day boat, built as a one off in Devon to an unknown design. 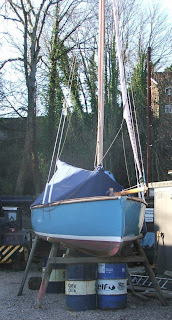 Down at Salterns Boatyard on the river, my friend Greg builds the Memory, a delightful 19 foot gaff sloop. 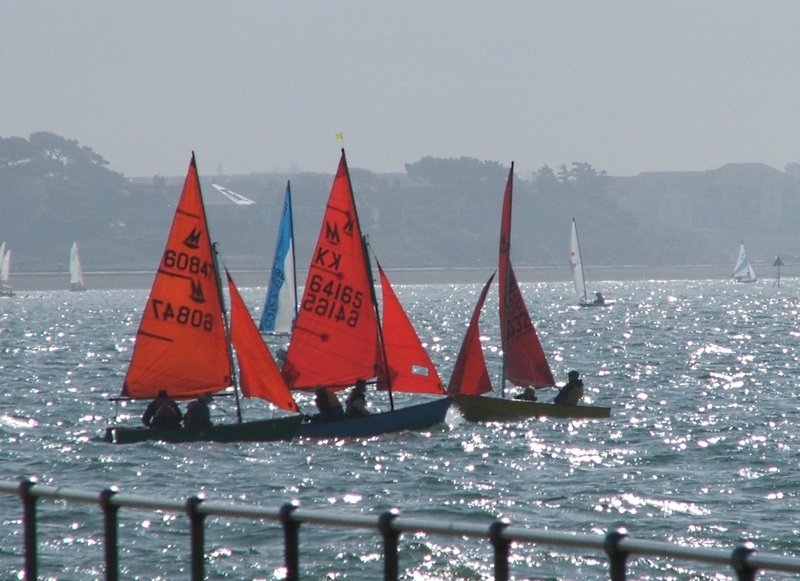 Inspired by the refined shapes and practicality of the small, shoal draft fishing smacks of Brightlingsea, Memory's are also very fast, regular winners in the Old Gaffers Association races. 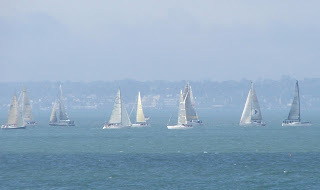 A few years ago Roy Hart and his Memory Greensleeves competed in the 1800 strong "Round the Island Race" around the Isle of Wight. Roy was first in class, but disqualified on a technicality for failing to have an orange smoke flare in his emergency equipment. Two years ago we held neck and neck until the last run back up Southampton water in heavy winds, when he left us for dust (or rather rain and spray), we came in second. Last year we had a great race and finished well ahead of Greg, only to be pipped on handicap. This isn't Flugel, it's a Memory which belongs to another friend, but you can see from the hull lines why they are such a fast boat.